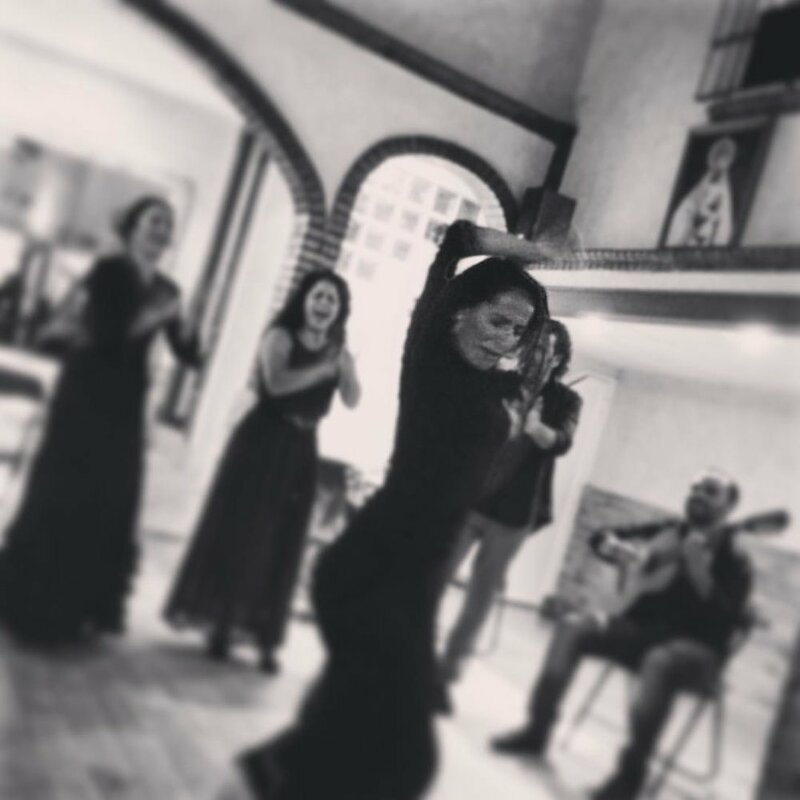 Six years ago, just before the very first Flamenco Tour to Jerez, I interviewed Mercedes Ruíz then followed up with some additional questions from readers a few months later. I published the interview in parts in Spanish and English back then; here it is today in full. When did you begin dancing? When I was four years old. And when I was six I joined Manuel Morao's company, a Roma man from Jerez, a flamenco company from here. We were in it for almost six years. We were all over Europe. And we were in New York too, for two and a half months. But really there I danced and I had fun, but I treated it like a game. A girl who wanted to dance for fun. And later when I was twelve or thirteen I said that I seriously wanted to do this professionally. I want to keep learning and doing my dancing, something that fills me. And being in companies as a child, did you still go to school? Yes, we went to school. And when we were gone for a long time they put us in Spanish school and everything. Before joining the companies, did most of your studying take place in Jerez? Yes in Jerez, but later I also learned a lot in workshops with people who came to Jerez. Javier Latorre, Yerbabuena... I learned all that I could. Find the translation to this poem here. And who did you study with in Jerez? I began with Ana María López. Then when I was twelve I went to the conservatory in Seville. I was in Seville for one year. And then I was with Chiqui de Jerez. I was there four or five years. And from there I also studied with a teacher Cadiz who is wonderful named Charo Crúz. She is an amazing teacher. She opened many doors for me. She really opened my mind. And through her I got in contact with El Cordobés, a flamenco tablao in Barcelona, the best tablao in Spain. I started at the tablao, and this was the beginning. What are some of the problems and how did you overcome them? 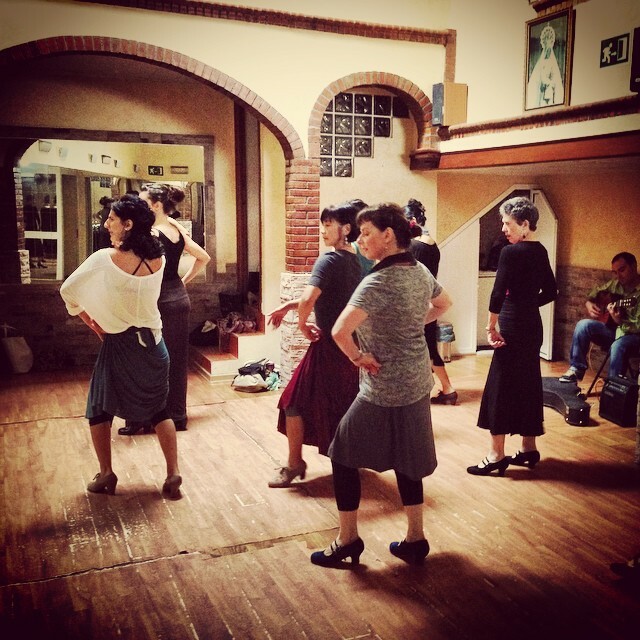 Was it hard for you being a flamenco dancer in Jerez coming from a non-flamenco family? Did you have a hard time being accepted? The truth is that all work has its issues... but I believe artistic work is a bit worse. It is very closed. It takes a lot of effort to get accepted into places, and this has a big effect on your everyday life because artists have a lot of aspirations, and they want to improve everyday, and if you don't feel good about yourself it's horrible. I have been faced with many obstacles, and I continue to encounter them, but you overcome them through daily work and without paying attention to others. I never looked at it this way. I am a person who does her own thing, and I haven't tried to be accepted. If I am, great and if not, What am I going to do? Things in life cannot be forced. Things happen as they're meant to happen. ¿Does anyone in your family dance or do anything related to flamenco? No and on top of things none of my siblings like flamenco dancing. But do they like flamenco? No, not at all. But they come to see your shows, right? Just my sister. I have four brothers, and they don't. They don't like it at all. I don't think they have any idea of the level. In other words I think that they think I dance sevillanas or something. How interesting. How is that possible? And does this bother you? Well, I have to respect that. The decisions. If they don't like it. Well, I'm used to it. My parents really are the ones who have helped me so much. My mother. When I was little they both supported me in whatever I wanted. They never prohibited me from doing anything. And now I am trying to give back to them all that they have offered me. I try to give it to them on stage. So your parents don't like flamenco either? No, of course. They like it now that I do it, but had I not started dancing I don't think you would ever have heard flamenco in my house. What is it like collaborating with your husband? The truth is it's great because we began working together before becoming a couple. And we've always spoken the same language. For him, it's music and for me dance. But both of us had the same language. So really it's completely easy working together. I can't say otherwise. And I'm used to it, and if he weren't here it would be so hard for me. It's like he is my right hand and he understands me perfectly on stage. So it's super easy. Do you have any rituals? Is there anything you do before going on stage? Really I'm very superstitious. So I always have the same things in the dressing room. You know? The same photos from years ago, and there's one thing it's that I can't go on stage without having brushed my teeth. I can't. Impossible. Can you believe it? As if I were going to a wedding. I know that you dance almost every day. What is the longest amount of time you’ve gone without dancing? Well, just recently, a week and two days while I was sick. And this makes you feel awful, correct? Of course because my body and mind are used to having flamenco shoes on creating and doing every day, but really for the past ten days I’ve been so stuffed up and sick that I haven’t wanted to do anything really. Toward the end I was getting annoyed. I wanted to be well. But really no, I don’t tend to go very long without dancing. I’ve never gone a whole month, never gone fifteen days. Never, ever, not even when I got married. And not even with Pastora? Well, when I had Pastora. I was dancing up until the day she was born. And after I had her, because I had a cesarean, I waited two weeks, and in the third I started dancing. When you’re dancing, are you listening to the words of the songs or are you listening more to the music? Before for example I didn’t pay much attention to the verses. Lately in shows Perspectivas and in Baile de Palabra I danced much more to the words, to what the singer was saying, to the meaning of the verse. In these shows I’m trying to dance much more to the meaning of the words. The music in its moment, in the more melodic parts, I love the guitar solos too. Before not so much but lately, yes, I dance a lot to the singing, to what the singer is saying because they are songs written for the show. The traditional verses about the cart of your fortune, about the hunger that I’m faced with, for example, no. But these are verses that have been chosen for the show and when it's time to dance the palo I have to express its nature and try to show with the body and with my dancing what the singer is saying. And if it were a letra, I don’t know, not from your show... Any letra, that's what I’m saying. If it’s an old letra, no. Because I haven’t experienced those things. The old verses are all the same, my mother... I’ve suffered... I’m hungry. These verses, no truthfully. In these cases it’s listening to the singer’s interpretation. The way he sings, not the words. Which dancers from today do you like? From today I like Pastora Galván. I like Israel Galván. I like Manuela Carrasco. And of those who are no longer around, Farruco, Carmen Amaya, Antonio Gades. Matilde Coral I love. Milagros Menjibar. The truth is I like a wide variety. I try to find the positive part and the good part of each dancer. You started when you were four years old, really young. There are a lot of people from other countries who started dancing as adults because they didn’t know what flamenco was or for other reasons. What do you say to these people? No big deal. It’s never too late to do what you want to do. I started when I was four because I was lucky enough to have been born in Jerez and because my mom took me to a flamenco academy. Art is art, and there are people who discover it earlier, and there are people who discover it later. But it’s no big deal. Well, if someone who is thirty and wants to dance professionally, this is a bit more complicated, you know? But if they want to learn and take classes. It’s all about dedication and interest and the time that you want to give to each thing, and if you do it at least to feel good or to do it correctly anyone can do it, you know? Well, anyone who has some natural ability. My mother can’t dance for example. Whoever has some abilities, an ear, and who before anything likes flamenco. As a professional, how do you relate to those of us who are not so dedicated. Like in your class there are all kinds of people and you relate well to everyone. How? For example the people who are really dedicated and the people who do it as a hobby? In class I have everything. People who want to dance and people who do it to feel good. In class I try to treat everyone the same. To those who are really serious I push them a little more or I ask more of them. But if there is someone for example who does it as a hobby and things don’t work for them then I tell them to relax but to those who are really serious I ask more of them. But in class I try to make everyone feel good. And those who do it as a hobby I love also because not everyone has to dedicate to dancing flamenco up to eight hours a day. And so who does it for fun I love. It’s another way. They don’t have to be so perfect. It’s not necessary that it sound really good because they do it for fun. For those who are serious it’s more work because they need to do things the way they’re supposed to be done. What do you like about teaching? Because in taking your classes, I think I told you, in Jerez I felt a bit disoriented. I felt so different from everyone there. Then I came to your class and I could tell how much you loved to teach. And I felt so good being there. I love teaching. I love it. Why do you love it? What do you get from teaching people? Because I learn so much. The students teach me as well. They teach me, and I learn. I love to watching a student when they are able to do something I choreographed. It fills me up the same as when I go on stage. It's like when I go on stage, and I perform a piece well; it's the same. I feel proud. And honestly the students teach me so much too. And Pastora, is she going to dance? Now she's dancing a little bit. A little bit, a little bit. With red. Unbelievable. All of the time with her high heels. Speaking of this. I believe that dancing can help you in many areas of your life. How does dancing help you in your life? It's how I express myself. Dancing is part of my life. I get up, I eat breakfast, I eat lunch, I eat dinner, I dance. You know? It forms part of my existence, my way of living. What do you like about bulerías? I like that it is a festive party palo, and I can improvise a lot. Why do you think bulerías is so difficult for us as foreigners? I think it's hard for foreigners because listening to the singing is such a big part of it, and until this is understood, one cannot dance in a natural-way. Was it hard to find confidence in your dancing again after your daughter was born? I never lost confidence. Honestly I am more motivated to dance now that I have a daughter. Are you going to have more children? At the moment I don't know. Does anyone help you with your daughter so that you're able to keep dancing? Without the help of my family I could never do it. The truth is that I have all that I need with the love of my husband, my parents, and my sister. What do you find to be more challenging, teaching someone who has the technical ability but struggles with expressing the passion from within or teaching someone without technical expertise but who possesses the inherent expressive component? 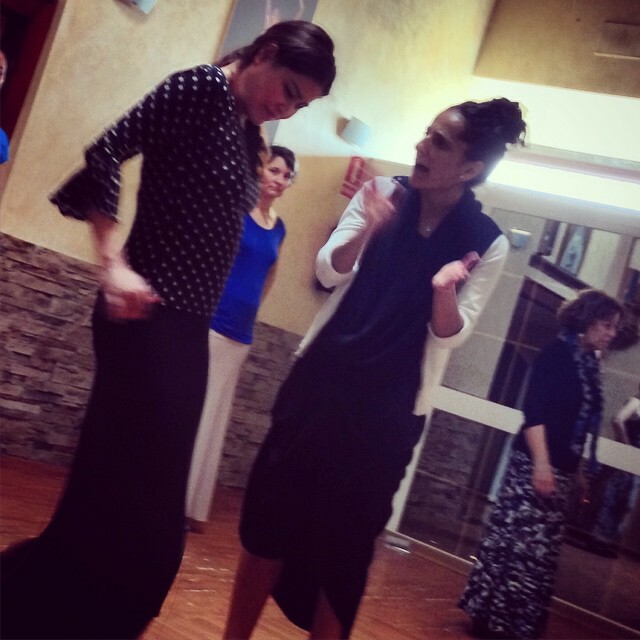 It is hard to teach one way or another because each thing has its specific requirements, but what I always teach in the same way to someone of high level or someone at a lower level is a respect for flamenco. 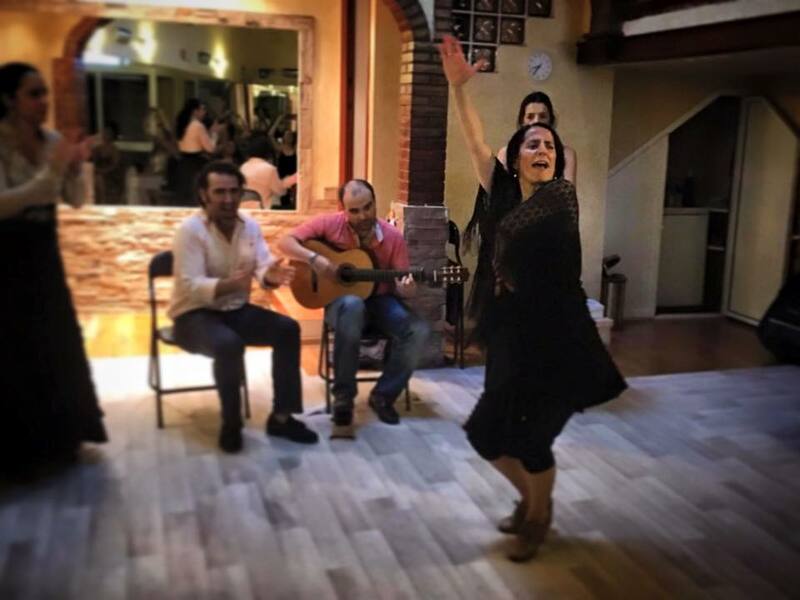 What advice would you give to a beginner in flamenco? What advice do you give in order to be successful, apart from practicing? To listen to a lot of singing and guitar as this will help immensely in better understanding flamenco. For each dancing event, how do you decide your choice of dress and color? It depends upon what I want to get across in that moment. The truth is that I am the type of person who leaves the wardrobe until the last minute. What style do you most like to dance and what style is the hardest for you to dance? The one I like the most is the siguiriya and the one that is the hardest for me is the siguiriya. You are very famous. When people see you on the street, how do you like them to treat you? In the most natural way. If they know me or if they want to meet me, it's fine with me that they approach me. Whatever, in the most natural way. Spontaneity. Tell us about the strangest experience you've had with a fan. Hmm. Let me think. Recently something happened that isn't strange, but it left an impression on me. A Russian girl who lives in Austria came to a workshop in August, and from that moment she has followed me to all of the workshops I've given. In Italy, in Jerez, in Germany... And I was dancing in February in Madrid, and when I left the dressing room she was there. And she hadn't told me that she was going to be there. Wow, what someone can do when they really like something. She came by herself to see the show, and this really impressed me. What are your long-term plans? The truth is I don't like to plan a lot so that I don't get frustrated. I try to live day by day. Maybe a month out... And for things beyond that, to keep creating and to keep doing. The next challenge truly is that I need to do another show on the same level as Perspectivas and Baile de Palabra. Something of the same level that seeks to display another Mercedes Ruíz. Transforming oneself, not always being the same, is the most challenging. What do you dream of at night? Oh my gosh, everything. I am a person who dreams a lot. About everything. But meaningless, about everything and always very complicated because my mind is always going. It's always thinking about what I'm going to do, this and that, always things that make no sense whatsoever. Where do you get your energy? Well, I think it comes from my excitement about teaching, dancing, learning. You can view the video interview I did with her at our apartments in Jerez here. Would YOU like to study with Mercedes? Do you have a question for Mercedes? What struck you most about her interview? What more do you want to know? Let me know in the comments below.